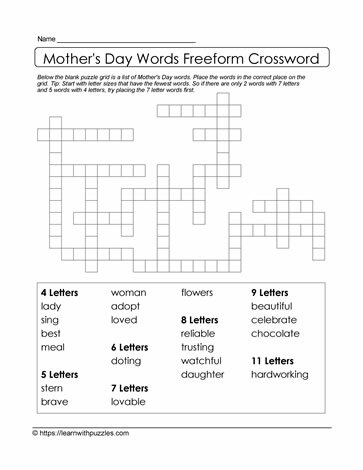 This freeform crossword puzzle for Mother's Day is similar to the crosspatch puzzle, except that words are organized by number of letters in the word. Puzzle expands kids' imagination and helps with problem solving strategies while learning about words related to moms, mothers, grandmothers, nanas. Words can include nouns, adjectives or verbs to describe behaviors that mothers do.